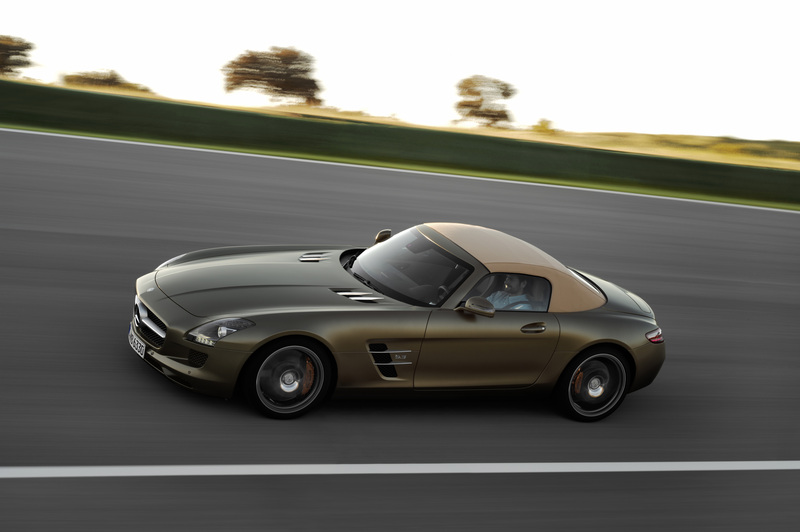 On Thursday, May 5, Mercedes-Benz released its first details on their upcoming SLS AMG Roadster. Now Mercedes has released more information on the specifics of the vehicles as well as new photos. The car, which is the soft top version of the SLS AMG, is scheduled to make its world premiere at the 2011 Frankfurt International Auto Show in September. Powered by a 6.2-liter front-mid engine producing 563 hp and 479 lb-ft of torque enables the SLS AMG Roadster to accelerate from 0-60 mph in just 3.7 seconds. The engine is mated to a seven-speed dual clutch transaxle transmission and the new Adaptive AMG Sport Suspension with aluminum double wishbones. The body and chassis of the SLS AMG Roadster is primarily comprised of aluminum. Fifty percent of the weight-optimized aluminum spaceframe is made of aluminum sections, 26 percent of sheet aluminum, 18 percent of cast aluminum and 6 percent of steel. The aluminum frame only weighs 536 pounds, 4.5 pounds more than the Gullwing, and results in the roadster weighing in an estimated 3,661 pounds, just 88 more than the Gullwing Coupe. The SLS AMG Roadster also employs the new “AMG Performance Media,” a motorsport-inspired multimedia system that offers numerous telemetric displays such as lateral and linear acceleration, various engine data and lap times on a racetrack. AMG Performance Media is activated by pressing the AMG key in the AMG Drive Unit. It also allows the driver to keep track on vital engine and transmission temperatures, output, torque and acceleration data and individual tire pressures. This high-tech blend technology and raw power give the SLS AMG Roadster characteristics that will please even the most discerning enthusiasts. The interior of the SLS AMG roadster is just as inspired and technologically as the exterior. Taking many cues from the aviation industry, the interior features a dashboard in the shape of a wing, the air vents resembling jet engines and the new E-SELECT lever is in the shape of an aircraft’s thrust control. Some of the standard options for the interior are heated AMG sports seats, COMAND with Navigation and DVD player, anti-theft alarm system with tow-away protection and interior monitoring and dual-zone automatic climate control. The interior is available in eight colors with the standard being black designo leather. Single-tone or two-tone designo leather in espresso brown is available as a new interior color too. To accompany the designo leather interior, various trim finishes including leather, matte-finished solid metal or carbon-fiber are available. After hearing about all of these new details the anticipation continues to mount. If the SLS AMG Roadster is anything like the Gullwing Coupe then it will surely be something worth waiting for. September can not come soon enough. ← Poll: M3 Coupe or 1-Series M Coupe?